I was skeptical upon my viewing of Into the Wild. I have friends who swear by this movie, ranking it among their favorites, but I was worried that it would be too similar to Werner Herzog’s Grizzly Man, a similarly true tale that did very little for me. While both films have similar concepts — a man giving up everything to live in the wild — I felt that I could empathize more with Into the Wild’s lead character, much to the credit of director Sean Penn’s adaptation. Emile Hirsch stars as Christopher McCandless, a middle-class kid who promptly gives up everything after graduating from college. He donates his savings (approx. $24,000) to Oxfam, ditches his car near a beach, and proceeds to live as a vagabond, happily drifting across the continental United States. His reason? He doesn’t agree with society, and the feeling of being trapped by its expectations. His ultimate goal is to live alone in the Alaskan wilderness. This is an admirable notion, to be sure, but his lack of care and respect for his family is appalling. He doesn’t like his parents (Marcia Gay Harden and William Hurt), a stuck-up couple that are abusive to each other, but his little sister (Jena Malone) adores him. He shuns all of them, opting to go on his own personal journey. Christopher’s selfishness is disturbing, but it’s hard to stay upset at him thanks to Hirsch’s fantastic performance. He is charming, intelligent and has a strong set of morals when dealing with stranger (i.e. passing up on the chance to fornicate with a 16-year-old Kristen Stewart). On the road, Christopher dubs himself Alexander Supertramp, and he meets a wide variety of characters, all memorable in their own way. There’s an old hippie couple (Catherine Keener and Brian H. Dierker) that he develops a strong connection with. In South Dakota, Alexander gets a job with a harvesting company owned by Wayne Westerberg (Vince Vaughn). In California, he meets an old retired veteran (Hal Holbrook, in an amazing performance) who begins to feel as if “Supertramp” is his own grandson. In different ways, Christopher makes an impact on all of their lives, then quickly goes off on his own, seemingly never to be seen again. The film is presented in nonlinear fashion, showing us glimpses of Christopher alone in Alaska, then showing us segments from his road trip leading up to that point. This connection is masterfully created by Sean Penn, who also wrote the screenplay. The cinematography is simply stunning, beautifully showcasing the glorious splendor that can be found in a country as large as the United States, even in places that might not be expected (i.e. South Dakota). Special mention must be made of the movie’s soundtrack, performed by Pearl Jam’s Eddie Vedder. I am not a big Pearl Jam guy, but damn if this score doesn’t hit all the right spots. A perfect fit for the vast, expansive nature of the movie’s central theme. 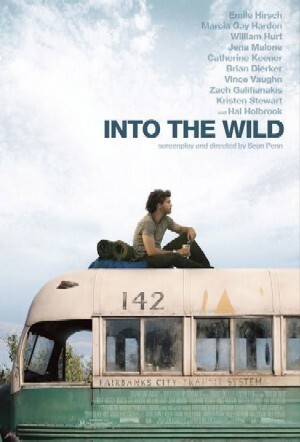 Perhaps Into the Wild runs a little long, and yes, the main character is decidedly selfish, but this film is emotionally stirring in ways that I was not expecting. I felt a connection to this young man and his idealistic beliefs. He had a great message (and could have redeemed himself), it’s just a shame that he took it to such an extreme. It definitely sounds intriguing. I haven’t seen this and know very little about it but I think I’ll add it to my to-watch list. It’s definitely worth checking out, especially if you have any interest in traveling/nature. Hope you’re able to see it soon, Dan. GREAT film, glad you enjoyed it! Into the Wild is one of those special breeds of film where I loved it…but I probably won’t ever watch it again because it’s such difficult and upsetting material. The death scene goes on way too long but it is necessary. Yeah, I can see that. It’s not exactly an uplifting film. Still something everyone should see at least once, I think. oh my god oh my god oh my god!!! Man, that soundtrack is something else. Just fantastic work from Mr. Vedder. Glad to hear you guys are fans. I’m not a fan of Sean Penn so that’s why I haven’t seen this movie yet. I might give it a try one of these days as the story does sound intriguing. Not a fan of Sean Penn? Really? I wouldn’t let that stop you from checking this out, though. It really is a fascinating movie. The movie was decent enough but I was a bit tickled that they would glamorize this guy who just disappears without letting his family know and all this time, they are looking for him while he is trekking across country. Yeah, I hear ya Cas. I wish this guy would have at least stayed in contact with his sister, or even just take an extended trip without going to the extremes that he did. Too bad his family had to suffer because of his selfishness. I still thought it was a great movie, but I can see how it would upset a lot of people. Nice to hear you liked Into the Wild. It is one of my favs from recent years, the picture is great and the soundtrack is very good too! I think I enjoyed it a bit extra, since I am a bit of a nature/trekking guy. But I agree with you on him being a bit over-selfish “throwing” his family away just like that. Yeah, I think this movie can really connect with nature lovers. There’s a lot to like in it, especially the beautiful shots of the Alaskan wilderness. Really enjoyed Into the Wild and glad you did too. Totally agree with you on the soundtrack. It’s beautifully done – every single song. This is the kind of film that makes me feel like I need to do something with me life. Very moving stuff. GRIZZLY MAN did litte for you, really? That movie invariably shakes up viewers. McCandless certainly lived in that tradition, traveling to the last frontier, though his journey was more inward and self-driven versus Treadwell who was living (and dying) to protect the bears. Nice review! Hi Colin, thanks for commenting! I know a lot of people really enjoyed Grizzly Man (even going so far as to include it on “best of the decade” lists), but I had a hard time empathizing with Treadwell. For a man who loved bears as much as he did, he ultimately ended up doing them a great disservice, as the bear that killed him was shot dead shortly after. Treadwell would not have wanted this to happen, but his ignorance made it possible. McCandless acted selfish as well, but he only endangered himself via his actions. By living among the bears, Treadwell was making them more comfortable around humans, which could potentially result in future disastrous encounters. Great post, I really need to watch this one as it seems to have slipped off my radar.